Ticks are not insects but belong to the same family as spiders and unsurprisingly they tend to elicit the same response in many people as spiders. Ticks are parasitic feeding on animal and human blood. If left untreated, a tick can cause serious medical issues depending on both the type of tick and the individual concerned. Approximately 70 tick species can be found in Australia and of these, 16 have been reported to feed on humans. The Paralysis tick (Ixodes holocyclus) is responsible for around 95% of tick bites and tick born illnesses in Eastern Australia. 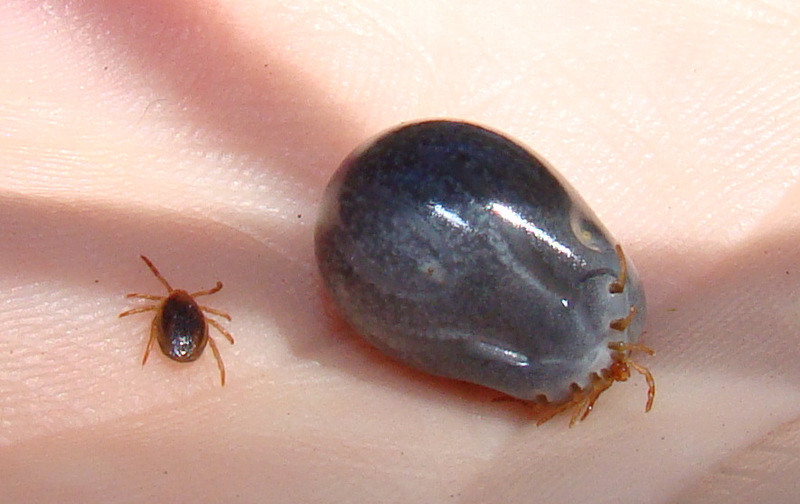 Ticks have a four-part lifecycle going from egg, to larvae to nymph to adult stage. The ticks will usually stay on vegetation not far off the ground waiting for some animal to wander past and then hitch a ride. Ticks attach themselves to their host by piercing the skin with their sharp mouthparts and in the process of feeding on the host’s blood, they inject an anticoagulant as well as saliva, which is where the health issues may occur. In the USA, ticks may spread Lyme disease but as yet, there is no evidence that Lyme diseases is present in Australia. We do have tick borne illnesses in Australia including those caused by the Paralysis tick. More recently a new problem of ‘tick-induced mammalian meat allergy’ has been identified and like it sounds this causes an allergic reaction to red meat and meat by-products such as gelatine. One of my claims to fame is that I am a ‘tick magnet’. No, not a misprint. Up until a few years ago if I was hiking in a tick infested area almost without fail I would be the one who would find a tick, or rather a tick would find me. Over the past few years I have changed my hiking practices and it is very rare for me to have an issue with ticks although it was only recently that I managed to ‘find’ two ticks and I wasn’t even hiking. I was wearing long pants and enclosed shoes but had a short-sleeved shirt on and it was just around the bottom of the sleeve area that I picked up my two passengers. I noticed the first tick about two days later and it had managed to attach itself in an area where I have a tattoo so I felt, rather than saw it as it blended into the tattoo quite well. I found the second tick about two months later but it appeared to be dead. Both were very small and neither managed to go deep enough to feed. Ticks on the east coast of Australia are often present in the warmer, more humid coastal regions and it was here that I managed to pick up my most recent ticks in southern coastal NSW. Let’s look at the ways in which we can reduce problems with ticks. Essentially preventing comes down to planning. Be aware you are going to be traveling in areas that are known to have ticks, dress accordingly and do regular checks to ensure you don’t have any ‘passengers’. If you do remove them, do so carefully and as soon as possible.